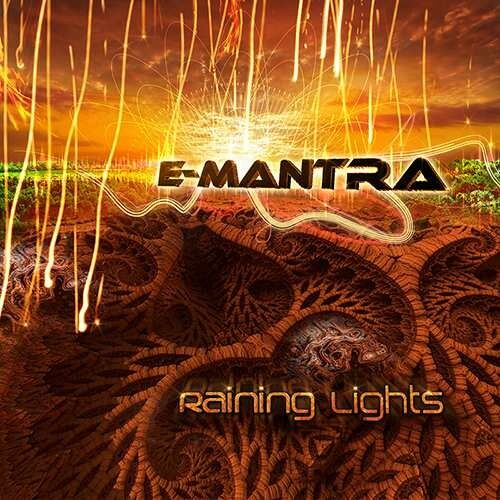 Acclaimed Goa Trance producer Emanuel Carpus (aka E-Mantra) returns for his fifth album with Altar records, with the brilliantly named “Raining Lights”, and what a beauty it is! Hailing from Constanta, a port city on the Black Sea of Romania, E-Mantra is a seasoned veteran and prolific composer, with several releases on respected labels such as Suntrip and Altar, under a variety of aliases (E-Mantra, Emanuel Carpus, Neurosect, and Night Hex, to name a few). Early on in his career Emanuel was influenced by a wide variety of sounds, including acid, techno, and of course trance, but he’s primarily known for representing Goa Trance and Goachill / psychill / psybient (call it what you will). One of the things that makes his productions special is the emotional richness he brings to his craft, as well as his ability to create a sense of traveling into other worlds (both inner and outer). If you had a rocket ship to explore the stars this would be your ‘go to’ sound track. Each song tells a story. This happens through his choice of sounds, and of course arrangements. Textures are lush, as melody lines are tripped out with delays that intertwine and morph in and out of the soundscape. His leads often have a modulating acid tinge that harken back to classic early TIP releases. Lush, mysterious, and completely hypnotic, these are songs that are a true joy to listen to. E-Mantra is always upping his game with each release, making him one of the most revered and respected producers from Eastern Europe, with several thousand followers on Soundcloud, and excellent reviews over the span of his career. One of the reasons he’s so popular is he represented Goa Trance at a time when Psytrance was on the upswing, so for fans of the old-school he became a sort of musical saviour. And while he’s moved on to other sounds to satisfy his artistic needs, he still maintains that respect for his roots, all with a polished, modern production that really allows the listener to get into a state of trance. For his latest sonic adventure, he highlights his mastery of his favourite genres by crafting a finely tuned tale that progresses seamlessly. The journey starts with an immersion into the depth of sound, an emotional tale that is sure to resonate. Here, he’s reaching the kind of spaces that people loved with the release of his 2012 "Silence" album. Things heat up slowly, and build to satisfying dance-floor oriented beats (peaking with a stunning remix of Kaleidoscope Clouds), and then onto more introspective and meditative vibes in the last stanza. The result is a cohesive experience that creates a sense of euphoria sure to thrill fans both new and old alike. The album title “Raining Lights” perfectly describes this release, as rain is both nourishing and cleansing, and also refers to water - a symbol of our emotions - and emotions are very present here. ‘Lights’ touches upon the healing and luminous aspect of his music. One gets the feeling he’s subconsciously downloading some advanced information. Yes, he moves into dark spaces at times, where thunderclouds appear briefly, but it’s always to put things in context and come back to the essence: radiant light. Each track is a gem, shining both on its own and within the constellation of lights that make up the entire album. In closing, E-Mantra once again proves himself to be the master of flow, and with this modern day classic, offers us a glorious musical experience that stands out no matter what the genre. “Raining Lights” promises to warm your hearts for the coming winter in 2016. We Hope You Enjoy the Journey!